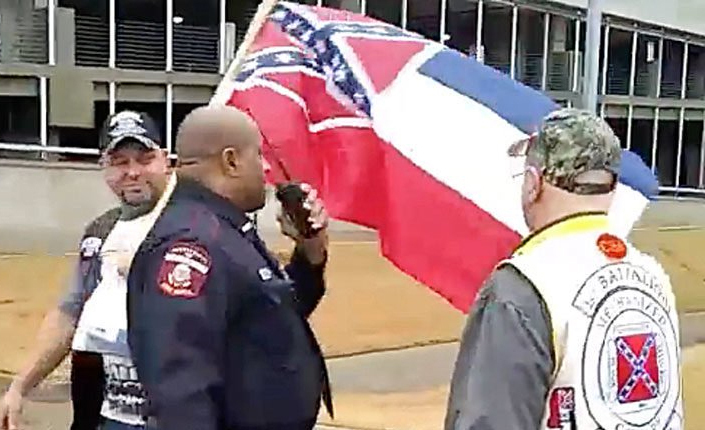 The U.S. Capitol Police have reinstated Officer Wardell Jackson, less than a day after being fired for confronting a man waving Confederate Flag in front of the Mississippi Civil Rights Museum according to multiple media reports. Unfortunately the powers that be have told Jackson he’s now on the midnight shift. Waving Confederate battle flags in front of the Civil Rights Museum is “almost like desecration” said state Rep. Kathy Sykes (D-Jackson). “Hopefully in the future our employees won’t be subject to harassment on their job,” Rep. Sykes continued. And hopefully the fact that Jackson is now working nights isn’t a result of him doing his damn job. Being a cop is hard enough.